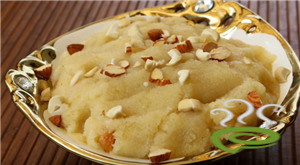 For preparing rava(sooji) halwa, first fry cashew nuts in the boiled ghee till its colour turns into golden and keep it aside. Fry the dry grapes also till its colour turns into golden and keep it aside along with the fried cashew nuts. Heat the rava in a frying pan and when the colour of rava turns into golden, add ghee and stir it well. Then add some milk also into this mix and stir it further for about 2 minutes. Mix some kesari powder in milk and add this lotion into the sooji mix and stir it well. Stir the mix further and if necessary, add sugar, milk, ghee etc. as required to make the halwa tasty. 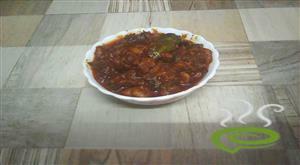 When the mix becomes into thick paste form, add the fried cashew nuts and grapes into it. Apply some ghee in a plate and change the mix into plate. Spread it well as shown in the below picture.Allow to cool the mix. 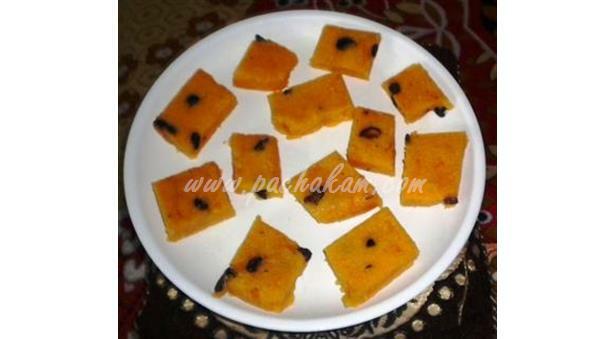 After 10 minutes, cut the halwa into small pieces. 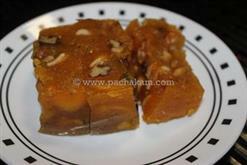 The Sooji Halwa is ready and can be served along with other snacks.